This engaging book offers readers the ultimate in calisthenics for the brain. Using the same fun, informative, and accessible style that have made his previous books so popular, Philip Carter helps people identify mental strengths and weaknesses, and provides methods for improving memory, boosting creativity, and tuning in to emotional intelligence. 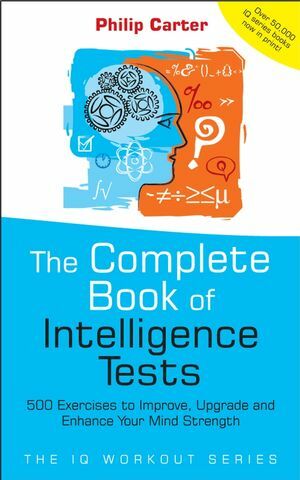 Featuring never-before-published tests designed specifically for this book, plus answers for all questions, this latest treasure trove from a MENSA puzzle editor outlines a fun, challenging program for significantly enhancing performance in all areas of intelligence. Philip Carter is a UK Mensa Puzzle Editor and vastly experienced author. He has written & co-written well over 100 books on all aspects of testing, puzzles and crosswords. Visit The Enigmatic World of Philip Carter at www.knowl.demon.co.uk. Section 1 - Verbal aptitude. Test 2.1 Synonym test A. Test 2.2 Synonym test B. Test 2.3 Antonym test A. Test 2.4 Antonym test B. Test 2.5 Analogy test A. Test 2.6 Analogy test B. Test 2.9 Advanced Verbal test A - multi-discipline. Test 2.10 Advanced Verbal test B - anagrams. Section 11 - Numerical aptitude. Test 2.11 Numerical sequence test. Test 2.13 Working with numbers. Test 2.14 Advanced numerical aptitude test. Section 111 - Technical aptitude. Test 2.15 Technical aptitude test. Test 3.2 Progressive matrices test. Test 3.3 Advanced logic test. Test 4.0 Creativity personality test. Test 4.4 The bucket test. Section 11 - Lateral thinking. Test 4.5 Lateral thinking test. Test 4.6 Lateral thinking exercises. Section 111 - Problem Solving. Test 5.1 Anxious or relaxed. Test 5.2 Extrovert or introvert. Test 5.3 Optimist or passimist. Test 5.5 Tough or tender. Test 6.3 Verbal dexterity and memory test - anagrams. Test 6.5 Pattern recognition B. Test 6.7 Pattern recognition C.
Test 6.9 Attention to detail. Test 6.10 Memorising an address. 7. Answers, explanations and assessments.